The following are the six most common diet-based therapies people use to treat diabetes more naturally and holistically. The fact is that the body works hard and efficiently on its own to keep the blood at the proper pH. “Our body is capable of adequately maintaining the perfect acid-base balance regardless of what we eat,” says Vandana Sheth, RD, CDE, a spokesperson for the Academy of Nutrition and Dietetics, so there’s no need to alter the diet to try to affect the pH level. However, Sheth believes the alkaline diet can be a healthful choice for people with diabetes. “An alkaline diet is primarily a vegetarian diet, emphasizing fresh fruits, vegetables, soy, nuts, legumes, and olive oil,” she says. The theory behind the food-combining diet is that if protein and starch are eaten simultaneously, the body will wear itself out by producing both alkaline and acidic digestive juices, which nullify both the protein and the starch and impair digestion.4 This diet promotes eating proteins and starches at separate meals. Vegetables can be eaten with both protein and starch, but fruits should be eaten alone. Its proponents say this diet will encourage weight loss and improve digestion. Research supports that a weight loss of 10 to 15 lbs is enough to decrease insulin resistance and improve blood glucose levels in people with diabetes. However, there’s no scientific evidence stating this diet is beneficial for weight loss or digestion. In fact, “The research is flawed, and some of the ideas are counterproductive,” Melina says. For example, vitamin C in fruit can help increase iron absorption from iron-rich plant foods such as legumes. But according to food-combining guidelines, this combination isn’t permissible. For people with diabetes, this diet is contrary to the American Diabetes Association’s 2012 nutrition recommendations for optimal blood glucose control. Balancing a meal with both protein and carbohydrates promotes fewer carbs at the meal, resulting in more stable blood glucose and insulin levels. This diet incorporates the Asian philosophy that foods are either yin (cooler) or yang (warmer) and that certain health conditions require food that will cool or warm the body. The macrobiotic diet is vegetarian based, consisting mainly of brown rice, whole grains, and vegetables. It has gained popularity among cancer patients who understand it to be an effective way to treat the disease. Currently, there’s no evidence that a macrobiotic diet can prevent or cure cancer. Researchers are examining whether a macrobiotic diet can prevent and treat diabetes. A study published in the September 2012 issue of the Journal of Nutrition and Metabolism found that a macrobiotic diet could be a successful therapy for type 2 diabetes. The macrobiotic diet is naturally high in fiber, which helps to slow the conversion of starch to glucose, thus keeping the blood glucose level more stable. In fact, participants in this study were able to reduce their insulin by as much as 64%. This diet is very restrictive and could cause nutrient deficiencies in calcium, iron, vitamin B12, and protein.5 Contrary to the belief of raw food diet proponents, the enzymes needed for digestion are produced by the pancreas and small intestines. Research on the raw food diet is under way, but no studies have looked at the diet’s effect on diabetes specifically. The Maker’s Diet is based on eating foods that God “intended” for us to eat, such as whole natural foods, including organic meats, fruits, and vegetables. It also encompasses the four pillars of health—physical, spiritual, mental, and emotional—including increasing physical activity, reducing stress, and finding faith.6 The diet claims to improve health and promote weight loss, which will lower the risks of chronic illnesses, including diabetes. There are many benefits to adopting a lifestyle that will increase physical activity, reduce stress, and help one find faith. This is particularly true when it comes to diabetes, which can be a challenge physically, spiritually, and emotionally. The Ayurvedic diet, popularized by author Deepak Chopra, MD, is based on a system of medicine that originated in ancient India. It attempts to balance and restore harmony in the body by using diet, yoga, and herbs. Ayurvedic doctors determine which doshas are strongest and which are out of balance, and give a diet prescription that strengthens and balances them. Ayurvedic practitioners claim this diet will bring harmony back to the body and, in doing so, help with weight loss and decrease the likelihood of chronic illnesses, including diabetes. “It’s important for RDs to increase their knowledge and awareness of alternative approaches to diabetes self-management,” Sheth says, as more people with the disease turn to CAM to manage it. This will enable RDs to more effectively counsel their clients. To ensure coordinated and safe care, Sheth encourages RDs to communicate with their clients’ alternative medicine practitioners as well. 1. Bell RA, Suerken CK, Grzywacz JG, Lang W, Quandt SA, Arcury TA. Complementary and alternative medicine use among adults with diabetes in the United States. Altern Ther Health Med. 2006;12(5):16-22. 2. Egede LE, Ye X, Zheng D, Silverstein MD. The prevalence and pattern of complementary and alternative medicine use in individuals with diabetes. Diabetes Care. 2002;25(2):324-329. 3. Complementary and alternative medical therapies for diabetes. National Diabetes Information Clearinghouse website. http://diabetes.niddk.nih.gov/dm/pubs/alternativetherapies. Last updated January 24, 2012. Accessed November 18, 2012. 4. Davis B, Melina V, Berry R. Becoming Raw: The Essential Guide to Raw Vegan Diets. Summertown, TN: Book Publishing Co; 2010: 176-178. 5. Raw food diet. WebMD website. 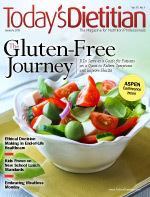 http://www.webmd.com/food-recipes/guide/raw-food-diet. Reviewed February 20, 2010. Accessed November 11, 2012. 6. Longe JL. The Gale Encyclopedia of Diets: A Guide to Health and Nutrition. Farmington Hills, MI: Gale; 2007: 643-646. 7. Ayurvedic medicine: an introduction. National Center for Complementary and Alternative Medicine website. http://nccam.nih.gov/health/ayurveda/introduction.htm. Last updated July 2009. Accessed November 11, 2012. 8. Hardy ML, Coulter I, Venuturupalli S, et al. Ayurvedic interventions for diabetes mellitus: a systematic review. Evid Rep Technol Assess (Summ). 2001;(41):2p.